Five Rivers MetroParks welcomes groups, families or individuals to explore their wild sides by spending a night under the stars in one of 23 campsites. Camping is a great way to experience nature at dawn, dusk and even after dark. Five Rivers MetroParks offers frontcountry campsites that are easily accessible by car and hike-in backcountry sites for the more adventurous camper. Both offer a way for you to unplug just a short drive from home. 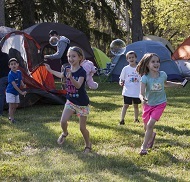 With five easily accessible campsites and built-in amenities such as fishing ponds, hiking trails, the historic Argonne Forest, a sustainable farm and more, Possum Creek MetroPark is an excellent place to take your next camping trip with your family, a scout troop or a first-time camper. Picnic tables, pit toilets and firewood are provided. Permit required. On the north end of the county, Englewood MetroPark offers four frontcountry campsites near woodlands, meadows and waterfalls. Built-in activities include 9.5 miles of hiking trails through a wide variety of forest habitats and beautiful waterfalls, fishing and paddling opportunities on the Stillwater River, a disc golf course, a nature playground and a spot for fossil collecting. The Stillwater Trail offers nearly 2 miles of paved bike paths through the park, so bring your bike! Picnic tables, pit toilets and firewood are provided. Permit required. One of our most wild and scenic MetroParks, Germantown, has two frontcountry campsites — both offering a remote and nature-filled experience. Each site is connected to the park’s nearly 14 miles of hiking trails, a rich diversity of towering trees, prairies, meadows, steep ravines and the Twin Creek. Spend your days hiking, fossil collecting, fishing or just enjoying the amazing sites and sounds of the Twin Valley. Picnic tables, pit toilets and firewood are provided. Permit required. The historic Camp Hook area at Twin Creek offers three frontcountry campsites with access to the park’s extensive hiking trail system. The more than 10 miles of trails in the park’s rugged terrain connect to the 22-mile Twin Valley Trail and take you along the beautiful Twin Creek, by a prehistoric Indian mound and up to a hilltop vista. The amphitheater in the former Boy Scout camp makes this a great place for large groups to hold ceremonies. Picnic tables, pit toilets and firewood are provided. Permit required. The amphitheater is permitted separately on a first-come, first-served basis. Immerse yourself in nature in one of our secluded backcountry sites along the Twin Valley Trail. Ideal for backpacking, the three locations in Germantown and Twin Creek MetroPark offer a total of nine sites on the 22-mile trail. Accessible only by foot, these primitive campsites are large enough for two small backpacking tents and each location has a vault toilet and a common area for cooking and hanging out. Our programs build on one another (Discover then Develop then Do) — all striving to empower you to feel comfortable and confident in the activity. If you are new to the activity, begin by exploring the Discover programs and move on to build your skills. Those with fundamental skills can deepen their knowledge with Enhance programs. Programs listed are offered in rotation. Check the Program & Event Finder for specific dates and times. Experience the outdoors at Five Rivers MetroParks reservable facilities. Open-air shelters in beautiful, natural settings are excellent for BBQs, family reunions, birthday parties and more, or plan an overnight camping adventure with numerous park amenities nearby! Curabitur vitae convallis lorem, eget sodales diam. Phasellus scelerisque vel nibh maximus vestibulum. Quisque luctus aliquet quam nec consequat. Stay updated on your favorite topics! Copyright © 2019 Five Rivers MetroParks. All rights reserved. Is this the first time you have visited the website? What is the PRIMARY reason you came to the site? If you did not find any or all of what you needed, please tell us what information you were looking for. What grade would you give us on your overall experience? Please add any comments you have for improving the website. We welcome suggestions on specific areas for improvements, features you would like to see added to the site, and examples of what you consider good websites.